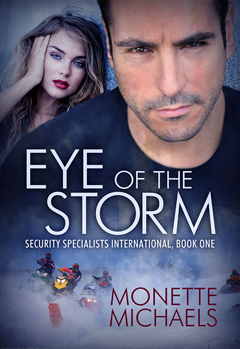 I am so excited to announce that the first book in the Security Specialists International series, Eye of the Storm, had been chosen as part of iBooks Discover a New Author for Free feature. From December 1 thru 15, you can go to iTunes Store and download Eye of the Storm for zero dollars. Here is the LINK to Eye of the Storm on iBooks (from there you can go to the store to purchase). Here is the LINK to all my books at iBooks. “Pepsi, sis?” Tweeter called out from the bar. Was he teasing her? If he was, it was irresistible. She held her burger up for him. He leaned in closely and his mouth descended, first taking a nip of the tip of a one of her fingers then a bite of the burger from the spot she’d torn into. “Good—to both bites,” he murmured, licking his lips. His smiling gaze captured hers and held her prisoner. “She’s nice—don’t take advantage of her.” Keely eyed Vanko and Tweeter—and then Ren. She wanted to make it clear the Argentinean girl was off-limits. Teresa was too innocent for the likes of these warriors. Vanko was a lady killer. Her brother, all her brothers, had a similar reputation. As for Ren, his files at the FBI and CIA and all his military records classified him as practically a monk. He was acting against type in his recent assiduous care of her, and she found it hard to believe that she was woman enough to change his lifelong relationship patterns. But as with any statistical pattern, there were always outliers. Outliers were unpredictable and never followed the rules. “She doesn’t think of you at all.” Ren grabbed her hand and brought her burger back to his mouth, taking another bite. “You can eat anything of mine you’d like.” He winked at her. She choked, coughed, then blushed, quickly taking a sip of Pepsi. She’d have to reread his files, maybe she’d missed something about him being a rogue—either that or he was the statistic that disproved the numbers. Oh yeah, he was definitely flirting. Her gaze inadvertently drifted to the front of his lightweight trousers. His package made Trujo’s goon’s Baja-sized bulge look dinky. She licked suddenly dry lips and reached again for her soft drink. She looked at her brother and stuck her tongue out. And you can still download two SSI novellas, Stormy Weather Baby (Book 1.5) and Storm Front (Book 2.5) for FREE at Liquid Silver Books. Happy Holidays from iBooks, Liquid Silver Books, and me! ~ by Monette Michaels on December 1, 2014.